Conrad Edward Anderson was born near Ventura, IA, son of Lars and Lena (Pedersdatter Benerud) Anderson. He was baptized January 5, 1887 in Ellington Prairie Lutheran Church and confirmed there August 10, 1901. He received his elementary education at Concord School. 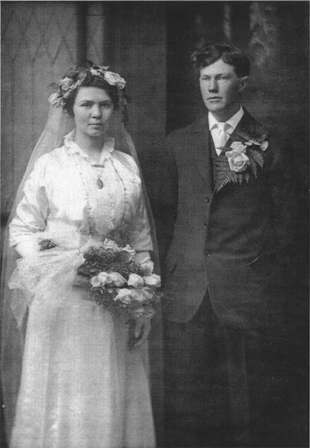 He married Cora Grace Hall (1892-1961) on October 14, 1914, and they farmed near Ventura until 1955. He served on the Ventura School Board, as a director of the Ventura Cooperative Elevator Board and the telephone company, and as secretary of Ellington Prairie Lutheran Church. Conrad and Cora had five children: Nordahl (1915-1990); Grant (1918-1987); Ardith, Mrs. Edwin Furness (1922- ); Leonard (1924-1925); and Roy (1932-1995).